You know what the upside of getting the Super Bowl is? A network can slip in dozens of mini-commercials for its new and upcoming shows to try and improve ratings and get fans excited. Tonight, CBS has taken full advantage of that marketing scheme, and in the midst of all those promotions, one of them dropped a bombshell. Apparently, The Good Wife is ending after this season. The potential conclusion to the much-heralded series has been rumored for weeks. In fact, it’s been rumored for years. Thanks to a slew of awards nominations every season and lots of positive buzz among critics, The Good Wife has continually dodged the cancellation axe, despite mediocre ratings. Unfortunately, it seems the impending loss of the creators and showrunners, Robert and Michelle King, was just too much to overcome. It will officially end this season, as per a serious voiceover and graphic aired during tonight’s Super Bowl. Long considered one of network TV’s best dramas, The Good Wife was able to compete for both nominations and accolades against grittier, higher budget efforts like Game Of Thrones, and for a long time, it deserved every single piece of praise lobbed its way. Thanks to dynamite performances by lead Julianna Margulies and damn near every supporting player, The Good Wife was long able to weave a complicated, yet oddly approachable web of legal drama that fused together both a case of the week and a long-term story arc. The result was frequently a perfect balance of fun and emotion. With the loss of Josh Charles and Archie Panjabi, behind the scenes drama and an overall plot that got a little complicated and windy, however, the show has been losing steam for the past year or so. 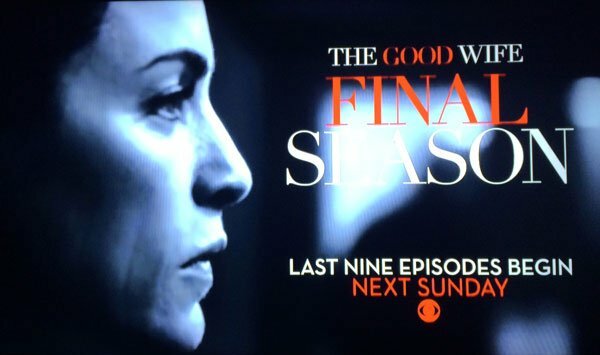 Now really is probably the right time to say goodbye, and if everyone involved in the show has 9 more episodes to end it how they want, there’s no reason to think The Good Wife won’t go out with a bang. The Good Wife airs on Sunday nights on CBS at 9 EST. Even if you’ve drifted away from the show over the years, I’d highly recommend you tuning in to the last 9 episodes. It should be absolutely wonderful.